ECORATORIO - An Ecological Oratorio: Mr Wolf, I presume? Yes, appalling as it sounds, I read the Trinity edition of my alumni magazine only now. One of the stories (pg 13) caught my eye for various reasons. Those of us who have a long-standing interest in Egyptian mythology would recall Anubis, the jackal-headed god of the dead, who held the unappealing portfoli o of funerals, afterlife, mummification, fate of souls, and protection of the dead and their tombs. This was presumably because Anubis’ animal counterpart, the Egyptian Jackal (Canis aureus lupaster; Hemprich and Ehrenberg, 1833), preferred to occupy burial grounds. 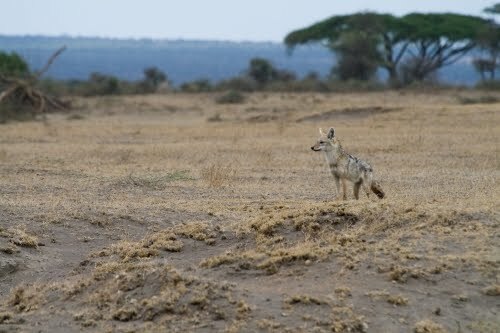 C.a.lupaster was considered to be a large, rare subspecies of the golden jackal (Canis aureus; Linn. 1758) even though there has been a historic (ahem) bone of contention over whether it is a jackal or a wolf (given its wolf-like morphology). Ancient Greeks considered these to be smaller versions of the European wolves; evolutionary biologist Thomas Huxley, after comparing the skulls of C.a. lupaster and Indian wolves, considered the species as grey wolf; Walter Ferguson (1981) argued that it was a species of wolf after studying its cranial measurements. But research published earlier this year by collaborators from Oxford University's Wildlife Conservation Research Unit (WildCRU), University of Oslo, and Addis Ababa University has established the Egyptian jackal’s true skin. When the mitochondrial DNA of the Egyptian jackal was compared with that of the golden jackal, wolves, and wolf-like canids, the results demonstrated that the Egyptian jackal (whether in Egypt or Ethiopia) is (and should be renamed as) an African Wolf, a subspecies of grey wolf or a separate species in itself, which existed alongside the golden jackals and the rare Ethiopian wolf (Canis simensis, an unique but endangered species). Furthermore, sequencing of mtDNA from Ethiopian highland golden jackals revealed that these were, in fact, Egyptian jackals (i.e. the African Wolf). African wolves are closely related to the Indian (Canis lupus pallipes) and Himalayan wolves (Canis lupus chanco- with 2.4% divergence). What does this bode for the species? The authors of the PLoS study called for assessing the status of the African wolf. Its previous classification as a subspecies of golden jackals meant being listed as a species of least concern by the IUCN. But since this is now the only grey wolf species in Africa, this could be rare and endangered. p.s: The image is not mine! It would be a shame for such a historically important species to die out, I hope this helps protect it. Funny how a name can change perceptions - Anubis the Wolf God has completely different connotations to Anubis the Jackal God. True, David! :D Anubis might probably be happy with the new identification: a step up the ladder perhaps?